Popular perceptions achievement and racial and ethnic difference evolve far more slowly than does the reality of any specific population. 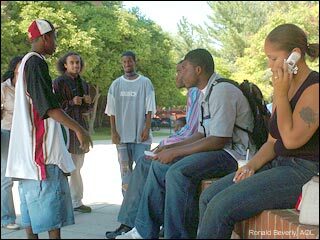 Thus, even as the rate of Black enrollment in higher education nears the overall percentage of Americans who are Black (12.9 in the 2000 census), and despite the fact that a full 80% of all African Americans over the age of 25 are high school graduates, U.S. residents of all ethnicities cling to the perception that Black people are persistent underachievers for whom even a high school diploma is a rare accomplishment. When it comes to popular perceptions of Black people, I am much more interested in how African Americans perceive themselves than I am in how white, Asian, Native American and Latin American people perceive us. Thus, I am most deeply concerned about the negative perceptions that Black people themselves have of our own academic performance and capabilities. My own interactions with Black people of all ages indicates that many African Americans perceive Black high school graduation rates and Black college matriculation rates to be far lower than they actually are. Indeed, I have had to cite specific sources in order to convince some of my brothers and sisters that their grim view of African American achievement is not necessarily the reality of the situation for all U.S. Blacks. This is not to say that inequality and inequity do not persist, nor is it to suggest that the Black-white achievement gap does not continue to rear it’s head in college graduation rates and in high school graduation rates, particular in underserved urban and rural communities in the U.S. I do believe, however, that a more accurate view of the state of Black achievement in higher education — and especially a greater emphasis on Black progress alongside the continued emphasis on areas of struggle) might counterbalance the overwhelmingly negative spin on the relationship of African Americans to all areas of intellectual endeavor advanced throughout both the mainstream and alternative media. The news about Black folks and education is not all good. But if we begin to emphasize the good alongside the bad, young people who are actively trying to figure out what it means to be Black and what possibilities exist for them as they grow and develop in to African American men and women will realize that the experiences of U.S. Black folks in both secondary and higher education are not monolithic, but are, instead, as diverse as young Black people themselves. As people we have to take education in our hands. We have to help our children love education, teach them to be entrepunears, teach them to give back to the community. Please check out the above website – this multi-talented young black male just turn 11 years old. Subscribe and keep up with with him.